State weather bureau estimated the location of Tropical Depression "ZORAYDA" at 52 km South of Hinatuan, Surigao Del Sur and now moving Northwestward. 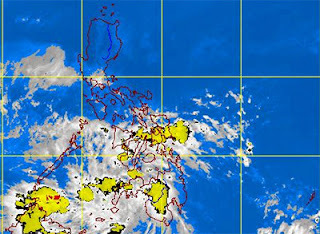 PAGASA weather bulletin as of 11 a.m. today, "Tropical Depression "ZORAYDA" has made landfall over Davao Oriental." PAGASA advised those residents in low lying areas and near mountain slopes to be alert against possible flashfloods and landslides. The estimated rainfall amount is from 5 - 15 mm per hour (moderate - heavy) within the 300 km diameter of the Tropical Depression, PAGASA said. "Sea travel is risky over the northern and eastern seaboards of Luzon," it added. For the meantime, please bookmark this page now or visit this site more often for you to be updated. You may also share this post to your friends so they may know about Tropical Depression Zorayda Update. Comments or suggestions about "Tropical Depression Zorayda Update as of Tuesday, November 12, 2013" is important to us, you may share it by using the comment box below.